For other uses, see Ghalib (name) and Mirza Ghalib (disambiguation). Ghalib (Urdu: غاؔلِب‎), born Mirza Asadullah Baig Khan (Urdu: مِرزااسَدُاللہ بیگ خان), 27 December 1797 – 15 February 1869), was a prominent Urdu and Persian poet during the last years of the Mughal Empire. He used his pen-names of Ghalib (Urdu: غالِب, ġhālib means "dominant") and Asad (Urdu: اسَد, Asad means "lion"). His honorific was Dabir-ul-Mulk, Najm-ud-Daula. During his lifetime the already declining Mughal empire was eclipsed and displaced by the Colonial British Raj and finally deposed following the defeat of the Indian rebellion of 1857, events that he described. Most notably, he wrote several ghazals during his life, which have since been interpreted and sung in many different ways by different people. Ghalib, the last great poet of the Mughal Era, is considered to be one of the most famous and influential poet of the Urdu and Persian languages. Today Ghalib remains popular not only in India and Pakistan but also among the Hindustani diaspora around the world. A special commemorative cover of Ghalib released in India. Mirza Ghalib was born in Kala Mahal, Agra into a family descended from Aibak Turks who moved to Samarkand (in modern-day Uzbekistan) after the downfall of the Seljuk kings. His paternal grandfather, Mirza Qoqan Baig, was a Seljuq Turk who had immigrated to India from Samarkand during the reign of Ahmad Shah (1748–54). He worked at Lahore, Delhi and Jaipur, was awarded the subdistrict of Pahasu (Bulandshahr, UP) and finally settled in Agra, UP, India. He had four sons and three daughters. Mirza Abdullah Baig and Mirza Nasrullah Baig were two of his sons. Mirza Abdullah Baig (Ghalib's father) married Izzat-ut-Nisa Begum, an ethnic Kashmiri, and then lived at the house of his father-in-law. He was employed first by the Nawab of Lucknow and then the Nizam of Hyderabad, Deccan. He died in a battle in 1803 in Alwar and was buried at Rajgarh (Alwar, Rajasthan). Then Ghalib was a little over 5 years of age. He was raised first by his Uncle Mirza Nasrullah Baig Khan. There are conflicting reports regarding his relationship with his wife. She was considered to be pious, conservative and God-fearing. He died in Delhi on 15 February 1869. The house where he lived in Gali Qasim Jaan, Ballimaran, Chandni Chowk, in Old Delhi known as the Ghalib ki Haveli has now been turned into 'Ghalib Memorial' and houses a permanent Ghalib exhibition. In 1850, Emperor Bahadur Shah Zafar II bestowed upon Mirza Ghalib the title of "Dabir-ul-Mulk". The Emperor also added to it the additional title of "Najm-ud-daula". The conferment of these titles was symbolic of Mirza Ghalib's incorporation into the nobility of Delhi. He also received the title of 'Mirza Nosha' from the Emperor, thus adding Mirza as his first name. He was also an important courtier of the royal court of the Emperor. As the Emperor was himself a poet, Mirza Ghalib was appointed as his poet tutor in 1854. He was also appointed as tutor of Prince Fakhr-ud Din Mirza, eldest son of Bahadur Shah II,(d. 10 July 1856). He was also appointed by the Emperor as the royal historian of Mughal Court. Being a member of declining Mughal nobility and old landed aristocracy, he never worked for a livelihood, lived on either royal patronage of Mughal Emperors, credit or the generosity of his friends. His fame came to him posthumously. He had himself remarked during his lifetime that he would be recognized by later generations. After the decline of the Mughal Empire and the rise of the British Raj, despite his many attempts, Ghalib could never get the full pension restored. Ghalib started composing poetry at the age of 11. His first language was Urdu, but Persian and Turkish were also spoken at home. He received an education in Persian and Arabic at a young age. During Ghalib's period, the words "Hindi" and Urdu" were synonyms (see Hindi–Urdu controversy). Ghalib wrote in Perso-Arabic script which is used to write modern Urdu, but often called his language "Hindi"; one of his works was titled Ode-e-Hindi ("Perfume of Hindi"). When Ghalib was in his early teens,[timeframe?] a newly converted Muslim tourist from Iran (Abdus Samad, originally named Hormuzd, a Zoroastrian) came to Agra. [according to whom?] He stayed at Ghalib's home for two years and taught him Persian, Arabic, philosophy, and logic. In keeping with the conventions of the classical ghazal, in most of Ghalib's verses, the identity and the gender of the beloved is indeterminate. The critic/poet/writer Shamsur Rahman Faruqui explains that the convention of having the "idea" of a lover or beloved instead of an actual lover/beloved freed the poet-protagonist-lover from the demands of realism. Love poetry in Urdu from the last quarter of the seventeenth century onwards consists mostly of "poems about love" and not "love poems" in the Western sense of the term. The first complete English translation of Ghalib's ghazals was Love Sonnets of Ghalib, written by Sarfaraz K. Niazi and published by Rupa & Co in India and Ferozsons in Pakistan. It contains complete Roman transliteration, explication and an extensive lexicon. Mirza Ghalib was a gifted letter writer. Not only Urdu poetry but prose is indebted to Mirza Ghalib. His letters gave foundation to easy and popular Urdu. Before Ghalib, letter writing in Urdu was highly ornamental. He made his letters "talk" by using words and sentences as if he were conversing with the reader. According to him Sau kos se ba-zaban-e-qalam baatein kiya karo aur hijr mein visaal ke maze liya karo (from a hundred of miles talk with the tongue of the pen and enjoy the joy of meeting even when you are separated). His letters were very informal; sometimes he would just write the name of the person and start the letter. He was very humorous and wrote very interesting letters. In one letter he wrote, "Main koshish karta hoon ke koi aisi baat likhoon jo padhe khush ho jaaye'" (I want to write lines such that whoever reads them would enjoy them). Some scholars say that Ghalib would have the same place in Urdu literature on the basis of his letters only. They have been translated into English by Ralph Russell in The Oxford Ghalib. What more remains for me to see." 1855, Sir Syed Ahmed Khan finished his scholarly, well researched and illustrated edition of Abul Fazl's Ai’n-e Akbari. Having finished the work to his satisfaction, and believing that Mirza Asadullah Khan Ghalib was a person who would appreciate his labours, Syed Ahmad approached the great Ghalib to write a taqriz (in the convention of the times, a laudatory foreword) for it. Ghalib obliged, but what he produced was a short Persian poem castigating the Ai’n-e Akbari and, by implication, the imperial, sumptuous, literate and learned Mughal culture of which it was a product. The least that could be said against it was that the book had little value even as an antique document. Ghalib practically reprimanded Syed Ahmad Khan for wasting his talents and time on dead things. Worse, he highly praised the "sahibs of England" who at that time held all the keys to all the a’ins in this world. The poem was unexpected, but it came at a time when Syed Ahmad Khan's thought and feelings were already inclining toward change. Ghalib seemed to be acutely aware of a European[English]-sponsored change in world polity, especially Indian polity. Syed Ahmad might well have been piqued at Ghalib's admonitions, but he would also have realized that Ghalib's reading of the situation, though not nuanced enough, was basically accurate. Syed Ahmad Khan may also have felt that he, being better informed about the English and the outside world, should have himself seen the change that now seemed to be just around the corner. Sir Syed Ahmad Khan never again wrote a word in praise of the Ai’n-e Akbari and in fact gave up taking active interest in history and archaeology, and became a social reformer. A large part of Ghalib's poetry focuses on the praise and veneration of Muhammad, which shows that Ghalib was a devout Muslim. Ghalib wrote his Abr-i gauharbar (The Jewel-carrying Cloud) in honor of Muhammad. Ghalib also wrote a qasida of 101 verses in dedication to Muhammad. Ghalib described himself as a sinner who should be silent before Muhammad as he was not worthy of addressing Muhammad, who, according to him, was praised by God. In his poem "Chiragh-i-Dair" (The Lamp of Temple) which was composed during his trip to Benares during the spring of 1827, Ghalib mused about the land of Hindustan (the Indian subcontinent) and how Qiyamah (Doomsday) has failed to arrive, in spite of the numerous conflicts plaguing it. Who holds the reins of the Final Catastrophe?'.
" Kulliyat-e-Ghalib Farsi", an anthology of Persian poetry of well-known Urdu poet Mirza Asadullal Khan Ghalib first released at Maulana Azad National Urdu University (MANUU) and later released at Tehran by Ambassadors of India and Pakistan jointly at a function sponsored by Iranian Ministry of Arts and Culture in Tehran on 20 September 2010.This rare collection contains 11,337 verses of Ghalib, was compiled by Dr. Syed Taqi Abedi. Speaking at the occasion, Dr. Abidi said that study of Ghalib would be incomplete without his Persian poetry. "Although Ghalib had earned his reputation in Urdu literature, the poet of Mughal era was more inclined towards Persian and produced high-order poetry in that language. At the literary "ru-ba-ru session" (Face to Face Sitting) organized by the Haryana Urdu Academy, where Dr. Taqi offered analytical study of the works of legendary poet Mirza Ghalib, both in Persian as well as Urdu.He informs that Ghalib wrote 1,792 couplets in Urdu by the year 1865 as against the 11,340 in Persian. He also opined that Ghalib was a visionary, a poet of humanism whose works are popular even after three centuries. Ghalib's closest rival was poet Zauq, tutor of Bahadur Shah Zafar II, the then emperor of India with his seat in Delhi. There are some amusing anecdotes of the competition between Ghalib and Zauq and exchange of jibes between them. However, there was mutual respect for each other's talent. Both also admired and acknowledged the supremacy of Meer Taqi Meer, a towering figure of 18th century Urdu Poetry. Another poet Momin, whose ghazals had a distinctly lyrical flavour, was also a famous contemporary of Ghalib. One of the towering figures in Urdu literature Altaf Hussain Hali was a disciple of Ghalib. Hali has also written a biography of Ghalib titled Yaadgaar-e-Ghalib. In prose Ghalib brought a revolution in Urdu literature by developing an easy, simple and beautiful way of writing. Before Ghalib Urdu was a complex language, Ghalib introduced a simple style of prose in Urdu which is like a conversation. Ghalib was buried in Hazrat Nizamuddin near the tomb of Nizamuddin Auliya. The side view of Mazar-e-Ghalib is shown in the image. siwaa-e-KHoon-e-jigar, so jigar meiN KHaak naheeN"
Indian cinema has paid a tribute to the legendary poet through a film (in sepia/black and white) named Mirza Ghalib (1954) in which Bharat Bhushan plays Ghalib and Suraiya plays his courtesan lover, Chaudvin. The musical score of the film was composed by Ghulam Mohammed and his compositions of Ghalib's famous ghazals are likely to remain everlasting favorites. Pakistani cinema also paid tribute to the legendary poet, through another film also named Mirza Ghalib (1961). The film was directed and produced by M.M. Billoo Mehra for S.K. Pictures. The music was composed by Tassaduq Hussain. The film starred Pakistani film superstar Sudhir playing Ghalib and Madam Noor Jehan playing his courtesan lover, Chaudvin. The film was released on 24 November 1961 and reached average status at the box-office, however, the music remains memorable in Pakistan to this day. Gulzar produced a TV serial, Mirza Ghalib (1988), telecast on DD National that was immensely successful in India. Naseeruddin Shah played the role of Ghalib in the serial, and it featured ghazals sung and composed by Jagjit Singh and Chitra Singh. The serial's music has since been recognised as Jagjit Singh and Chitra Singh's magnum opus, enjoying a cult following in the Indian subcontinent. Ghalib's life is the subject of hundreds of plays regularly performed in Northern India and Pakistan. These plays are based on his life and his personal and professional relationships. The late Sheila Bhatia began this trend on productions about Ghalib, in Delhi. Ghazal maestros like Jagjit Singh, Mehdi Hassan, Abida Parveen, Farida Khanum, Tina Sani, Madam Noor Jehan, Mohammed Rafi, Asha Bhosle, Begum Akhtar, Ghulam Ali, Lata Mangeshkar, Nusrat Fateh Ali Khan, Rahat Fateh Ali Khan have sung his ghazals. Many singers from all over South Asia have sung many of his ghazals. The 2015 film Masaan contains various examples of poetry and shaayari by Ghalib, along with works by Akbar Allahabadi, Basheer Badr, Chakbast, Mirza Ghalib and Dushyant Kumar. Explaining this as a conscious tribute, the film's lyrics writer Varun Grover explained that he wanted to show the character of Shaalu (played by Shweta Tripathi) as a person whose hobby is to read Hindi poetry and shaayari, as this is a common hobby of millenial and generation x youngsters in Northern India, especially when in love, but this aspect is rarely shown in Hindi films. Ghalib was commemorated on his 220th birth anniversary by Search Engine Google which showed a special doodle on its Indian home page for him on 27 December 2017. ^ a b c d Pavan K. Varma (1989). Ghalib, The Man, The Times. New Delhi: Penguin Books. p. 86. ISBN 0-14-011664-8. 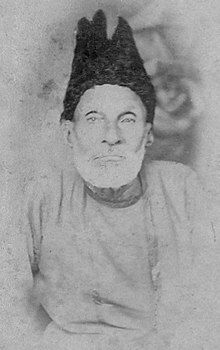 ^ "Mirza Asadullah Khan Ghalib". Brittanica. Retrieved 12 July 2014. ^ Nicole Dastur (12 May 2007). "Remembering 1857 in 2007". The Times of India. ^ Ras H. Siddiqui (27 July 2003). "Ghalib in California". Dawn. Retrieved 20 May 2013. ^ "No memorial for Ghalib at his birthplace, Agra". IBNLive. 27 December 2013. ^ Mirza Asadullah Khan Ghalib (2000). Persian poetry of Mirza Ghalib. Pen Productions. p. 7. ISBN 978-81-87581-00-0. ^ a b "Mirza Ghalib". Megajoin.com. Archived from the original on 3 November 2012. Retrieved 20 May 2013. ^ Byjameela Siddiqi. "Mirza Ghalib: The "Godless" Lover by Byjameela Siddiqi". Sufism.ru. Retrieved 20 May 2013. ^ a b c d e f g h i j k William Dalrymple (2009). The Last Mughal: The Fall of a Dynasty, Delhi, 1857. Bloomsbury. ISBN 978-1-4088-0092-8. ^ Omkar Nath Koul (2008). Modern Hindi Grammar. Dunwoody. p. 3. ISBN 978-1-931546-06-5. ^ "Mirza Ghalib". Megajoin.com. Archived from the original on 3 November 2012. Retrieved 20 May 2013. ^ Wheeler McIntosh Thackston (1994). A Millennium of Classical Persian Poetry: A Guide to the Reading & Understanding of Persian Poetry from the Tenth to the Twentieth Century. Ibex Publishers, Inc. p. 98. ISBN 978-0-936347-50-9. ^ "Shamsur Rahman Faruqui explains" (PDF). Columbia University. ^ "Dr. Sarfaraz K. Niazi". niazi.com. ^ Ali Asghar (6 May 2003). "Ghalib's letters". The Hindu. Retrieved 20 May 2013. ^ G. S. Amur (1992). Creations & Transcreations. Calcutta: Writers Workshop. pp. 83–84. ISBN 8171893910. Retrieved 18 September 2017. ^ The word a’in can mean all or any of the following: character, convention, temperament, habit, rule, path, law (ecclesiastical or secular), creed, praxis, quality, intention, organization, management, system, decoration, beauty. 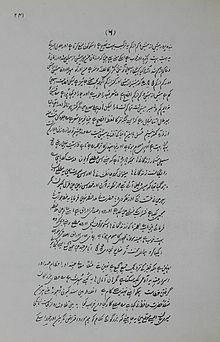 (Lughat Nama-e Dehkhoda). There are about eighty meanings in all, which seem to have developed over the centuries. Most were available to Abul Fazl; all were available to Ghalib. ^ He did edit another two historical texts over the next few years, but neither of them was anything like the Ai’n-e Akbari. ^ a b c Annemarie Schimmel (1985). And Muhammad is His Messenger – The Veneration of the Prophet in Islamic Piety. University of North Carolina Press. p. 115. ISBN 9780807841280. ^ Annemarie Schimmel (1985). And Muhammad is His Messenger – The Veneration of the Prophet in Islamic Piety. University of North Carolina Press. p. 81. ISBN 9780807841280. ^ Ralph Russell; Khurshidul Islam (1994). "Ch. 7". Ghalib 1797–1869: Life and Letters. Oxford University Press India. ISBN 978-0-19-563506-5. ^ Ramachandra Guha (2011). "Prologue". India After Gandhi: The History of the World's Largest Democracy. Pan Macmillan. ISBN 978-0-330-54020-9. ^ Serial No. 84, Publications of Ghalib Institute, New Delhi. ^ Anthology of Ghalib’s Persian poetry released – ANDHRA PRADESH. The Hindu (20 March 2009). Retrieved on 2018-12-18. ^ "The Tribune, Chandigarh, India – The Tribune Lifestyle". ^ Mutaala-e-Ghalib, 2nd edition, Danish Mahal Aminuddaula park publisher Lakhnow, 1987, p. 9. ^ "Divan-e Ghalib: Ghazal index". 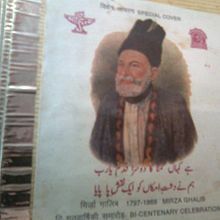 ^ "Mirza Ghalib". smriti.com. Retrieved 12 June 2014. ^ "Ghalib and his troubles". The Hindu. 11 January 2008. ^ "Ghalib forgotten on his 214th birth anniversary amid political chaos", Zaib Azkaar Hussain, The International News, 18 December 2011. ^ "Mirza Ghalib: Legendary poet of the Urdu language". aljazeera.com. 27 December 2017. Retrieved 27 December 2017. Urdu letters of Mirza Asaduʼllāh Khan Galib, tr. by Daud Rahbar. SUNY Press, 1987. ISBN 0-88706-412-4. Wikimedia Commons has media related to Mirza Ghalib.